The Hoover Committee selected Marti Rutherford as the 2017 Honoree for the significant contributions she has made to our chapter. She has volunteered in many ways to promote the education and conservation of native flora in our county. Marti is an observant person with a true curiosity about plants and plant communities. Her interest in better knowing native plants inspires her passion for collecting seed and experimenting with propagation. The plants she grows bring her enjoyment, which she happily shares with our chapter and the larger community. One of her important contributions is conceiving and orchestrating a successful native seed exchange at the October general meetings for the last two years. Marti assembled the Seed Collecting and Seed Saving Guidelines, available on our chapter website – anyone can participate in the native seed exchange. For many years, she has organized and provided seed for the annual Plant Sale, including preparation of leftover donated seed from the exchange. You can find her at the Sale, ready to address customers’ seed-related questions. there,” he says, because of her careful work. Since 2015, Marti has also actively served as one of the core leaders in restoration efforts along Mission Creek in downtown SLO. Some of the very plants that Marti has propagated herself are now installed along the Creek! As a strong advocate for native plants and plant communities, Marti voices her concern on issues important to CNPS as part of the public process, such as testifying for the recently approved county oak protection ordinance. 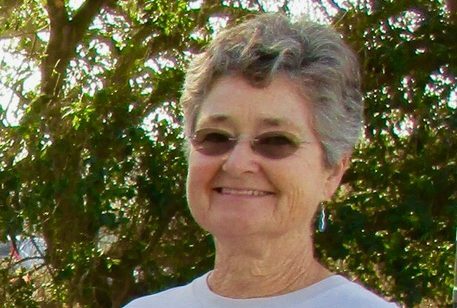 She is an influential native plant ambassador through her participation with groups such as the SLO Botanic Garden and the Master Gardeners Program. On a personal note, Marti and her husband Rob are proponents of good grassland stewardship through holistic management, protecting and promoting the growth of rangeland native grasses and forbs. You can rely on Marti’s assistance, be it at a CNPS booth or book sales table, general meetings or the annual banquet. She comes early for set-up and stays to help break down after events. The banquet flower arrangements have benefited from Marti’s artistic eye and the bounty of plant material she contributes from her garden. When a central place for our Board meeting arose, Marti found a good solution and seamlessly coordinated the room reservations. And finally, as Corresponding Secretary since early 2013, all general and banquet meeting speakers, as well as field trip leaders receive a thank you note from the chapter. For all of these reasons, we honor our friend Marti Rutherford with the Hoover Award, and thank her for being an important part of our Chapter and promoting the protection, use, and enjoyment of native plants.